Your Angry Birds weekend continues with this review of Angry Birds Star Wars, the latest game in a series that is recognizable practically everywhere. 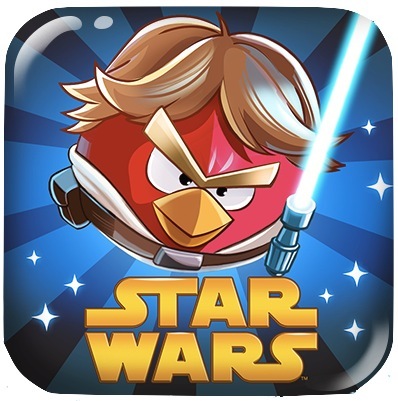 Giving Rovio another dollar of yours will allow you access to Angry Birds Star Wars (ABSW). ABSW is a new installment of Angry Birds, so that means there are logistical improvements. For example, ABSW recognizes a finished level much quicker than any of its predecessors. However, I feel that ABSW is really just a remake of the original game. Of course, the fact that it’s based off of Star Wars and utilizes features and planets from that brand name makes it pretty awesome, but if you take away the robes and names, you’ve pretty much boiled ABSW down to the original game. Not exactly, but for the most part. That’s not what the people want when they pay for a new installment. To contrast that previous thought, the birds are almost all-new in this game. One has a lightsaber and others can use the force or shoot laser guns. Besides that, and the relatively small number of Angry Birds Space-esque levels, ABSW is too close to the original. But that is, of course, not a bad thing. The original Angry Birds game was absolutely amazing, and if ABSW is like that one, then that also makes it worthwhile. Another detail is the fact that levels and level packs remain locked until you get up to them. In previous Angry Birds games, the levels within a pack would not let you proceed without completing the prior levels, but you could always switch into new packs if you got stuck. In ABSW, you can only unlock a pack when you get up to it, which is a little annoying, but the fact that they keep jamming power-ups into your face makes it easier to get through a level that would have previously had you stuck. Also, they seem to make a big deal about the total number of stars you get from all the levels in a pack, but as far as I could tell, these do not help you unlock anything other than some occasional power-up rewards. I personally do not use the power-ups because it takes away the creative and most fun aspects of the game. Additionally, just like in Angry Birds Space, the trajectory of your previous shot as well as the trajectory of your next shot are shown to help you figure out where exactly your bird is going to end up. This is always a good thing. In sum, ABSW is another great selection from Rovio, even though it is very similar to the original when you take away the Star Wars aspects. The most significant change are the birds, which each have Star Wars powers. There are some levels that incorporate the gravitational fields introduced in Angry Birds Space. ABSW is pretty polished, and each new Angry Birds game is getting more and more polished. It’s no doubt a great game, but that does not mean it doesn’t have its flaws. Nevertheless, Angry Birds Star Wars is a high recommendation for Star Wars fans, Angry Birds fans, or people just wanting to find an app that will keep them occupied for a while.